On this page you can see some important system data like CPU and RAM usage and manipulate running processes. 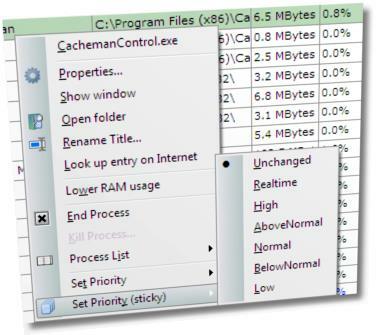 Cacheman displays a list of loaded Windows processes (Applications and System Services) along with the RAM Usage. If a process consumes more than 3% CPU Time the process name is displayed in blue color, if a process consumes more than 15% of CPU Time the process name is displayed in red. Above the column headers you can see the two most active processes. You can sort the process list by clicking on any of the column headers. You can also change the display order by drag & dropping column headers. If a process has a window, the icon of this window is displayed on the left side of the process name. If you doubleclick on such an item Cacheman will bring the window of this process to front. The most important Cacheman process features are Restart Process and Kill Process. What are these functions for? From time to time a Windows program can crash and become non responding. It completely stops to react to user input. In bad cases it can slow down your whole system and even stop other programs from working. When this happens, you usually show the Task Manager and try to end it. Unfortunately, it does not always work. A program can crash very badly and ignore even the Task Manager. You select End Process over and over, but nothing happens. In this case the Cacheman process management function should help you. It will remove (and optionally restart) the selected program from memory even if it does not play along nicely and refuses to respond. Since this feature should only be used as a last resort, you will be asked whether you really want to kill the process. The security dialog can be disabled on the options tab. You can click on a column header to sort the process list. You can drag & drop columns headers to change the display order. To disable a column reduce it's width to 0 pixels. To reset the column display use the corresponding function in the Process List sub menu. Doubleclicking a process with a window, will bring the window to front. The CPU Ticks column represents the CPU Usage of a process, since your computer has been started. If you want to use Cacheman as a Task Manager replacement make sure the Tray Icon is loaded on Windows startup (default). You can also configure a Hotkey to show the Cacheman settings window. Both settings can be configured in the Options tab.